After the unsuccessful multiplayer beta, there wasn’t much hope for the reboot of the grandfather of all first-person shooters. DOOM looked as though it’s fate was already sealed as a major disappointment of the year. Even some of the initial trailers made the gameplay look fast but not necessarily DOOM-fast. And it seemed there was a very limited amount of enemies on the screen at once. But upon release, the concerns I had were abolished after the first couple of levels in the campaign. A few years ago, id Software put out Wolfenstein: The New Order and it managed to be a very successful return to the franchise. The fast-paced Nazi killing action was a warm welcome to an era of cinematic campaigns. DOOM provides the same approach with even less focus on story and more focus on weapons, secrets and killing lots of demons. There’s three modes in DOOM: campaign, multiplayer and SnapMap. 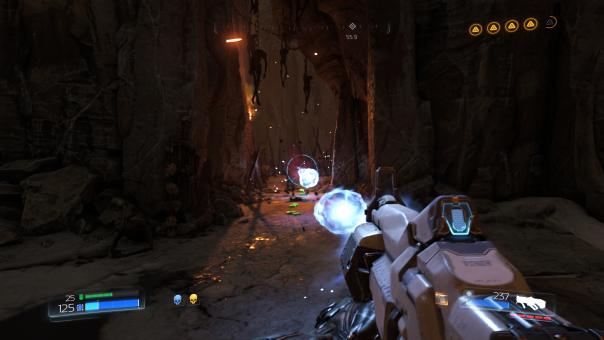 DOOM‘s campaign features intense action similar to the original games. It’s pure chaos and exactly what I was hoping for. With hardly any knowledge of what’s going on, you start the campaign with an energy pistol and a couple of demonic possessed scientist to take out. You continue through the map looking for an exit, and taking the heads off of any oncoming enemies that try to stop you. 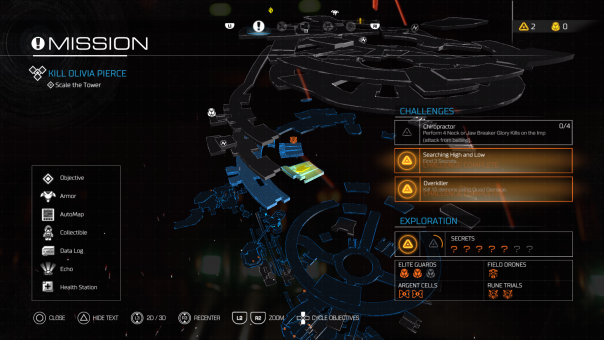 Each mission is loaded with challenges and secrets to look for in their unorthodox (at least for today) map layouts. Instead of heading from one side of the map to the other in traditional modern fashion, you’ll have to look for colored keys to open locked doors to proceed. Secret areas contain hidden weapons or collectibles, as well as challenge rooms. Challenge rooms pit you in tough situations to obtain a rune that will help you throughout the campaign. While these runes are generally not exactly necessary to the core game, they do have helpful attributes to help you along with way even if it’s something as simple as attracting health packs to you from further away. Each mission is packed with enemies to kill. 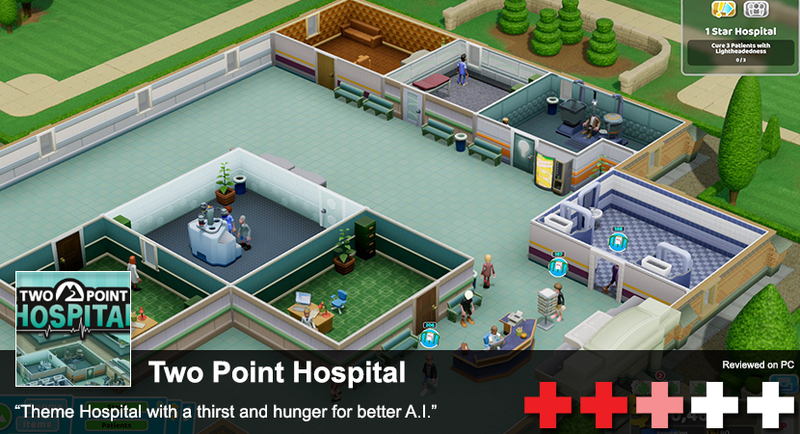 It’s a fast-paced action game and requires you to be aware of your surroundings at all times. When they introduce a new enemy, you’ll see that enemy appear in the mix more frequently. And the enemies are impressive, each with their own attacks and abilities. DOOM already has a collection of established demonic enemies at their disposal and they introduce some new meat to destroy. An area can be covered with enemies and that’s when you pull out the big toys to play. The weapon selection is very classic DOOM from shotguns and machine guns to plasma rifles and rocket launchers. Each weapon can be upgraded with weapon upgrade points to compliment your play style. As an example, the single barrel shotgun features either a rapid fire or explosive shell tech tree. It’s up to you how to customize your weapons. A major concern I had was if this game would feel like classic DOOM or end up paying tribute while going down a similar path DOOM 3 did. I’m proud to say I felt like this game was zapped straight out of the early 90s right into a modern game engine. It’s been a while since I’ve had to constantly look for health packs to heal or move constantly to avoid deadly projectiles. Being hit in DOOM takes a toll on your life bar so finding ways to heal is essential. They present a new way to kill any enemy to obtain health and ammo called Glory Kills. At points, enemies will be stunned in which a melee attack will brutally kill off said enemy in a stylized fashion. This releases orbs of health and ammo to you to keep you in the fight. It’s a bit distracting at first but after I was used to it, it was really cool looking and never really broke up the action. Plasma guns are effective at murder. 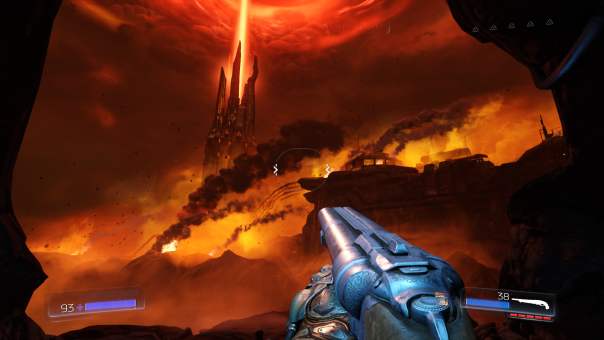 id Software developed id Tech 6 (or id Tech 666) for this reboot. It’s a beautiful and solid running game on PlayStation 4, usually never dipping below 60 frames per second even in the most chaotic battles. It comes at a small cost however. Similar to id’s last engine, id Tech 6 has texture pop-ins that can be a bit distracting. It’s not near as noticeable as id Tech 5’s pop-ins, but it happens occasionally. If you’re unfamiliar with what this looks like, it’s when the textures and bump maps haven’t fully loaded on the screen and gives a very low polygon look to every object in the world. It’s a lot less frequent this time around, but it still needs to be said. Audio quality is extremely well done almost every aspect. The first praise goes to Mick Gordon‘s incredible industrial metal soundtrack. When the music kicks in during intense action, it’s almost rhythmical to dance around your enemy and unleash hell on them. It’s never overbearing or distracting from the horrific sounds of the atmosphere. It’s a complimentary treat to hear it kick in at extreme moments. Outside of the music, the game has an incredible sound stage for those with home theater systems or hi-fi headphones. Each shot from a gun feels powerful and has a deep boom to it. The shotgun is surprisingly the weakest sounding weapon, but it still packs a punch through your speakers. Mars and Hell collide into some fancy artwork. Sadly, there’s not a cooperative campaign mode like older DOOM games but that’s where SnapMap comes in. SnapMap is a creation tool for designing single and multiplayer missions, competitive maps, and new game modes. It’s incredible simple to use similar to the editor for TimeSplitters. There’s basic gaming logic that’s snap-able too, so you could potentially make your own campaign and publish it on DOOM‘s community servers. If it’s good enough, it may be featured content in the SnapMap menu for all to see and download. I decided to create a pretty basic map to play around with this mode for the review. After a quick tutorial, I was hooked creating a horror mode with puzzles and Dark Souls difficulty with my enemies. Everything from the monsters to the light sources have programmable properties to easily tweak your creation to exactly how you want. For something so simple to use, it’s surprisingly deep with options. It should be interesting to see what creations fans create for the community. The last mode to talk about is the core multiplayer. It’s the least favorable mode for some after the beta letdown. It’s understandable since fans were looking forward to pure twitch/arena shooting. 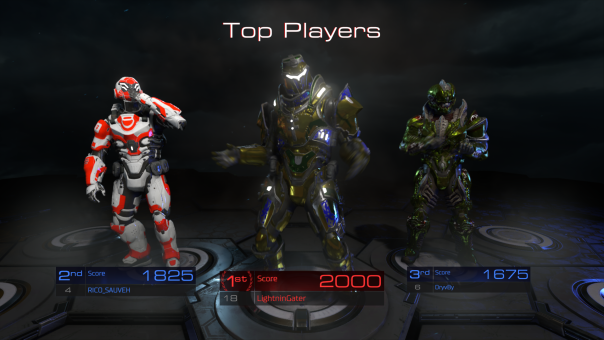 Instead, we were given an arena shooter without weapon pick-ups and armor that looked torn from the Halo universe. Has it improved? A bit. I’m less annoyed with the multiplayer as a whole, but it still leaves a lot to be desired. One of my original complaints with the public beta was the use of demon power up and melee attacks. It seems to have been addressed as I haven’t seen non-stop demons running around and someone hasn’t snapped my neck every other death. They should patch in a classic mode that eliminates class selecting and giant demon power ups. Arena shooters might be a hard sell to today’s audience, but having that mode would be a nice gesture since this game is a reflecting on the past. The amount of customization is nice as everything can be changed from different armor styles to even the amount of dirt and scratches that appear on the paint jobs. Weapons can be customized cosmetically too. The more you play, the more you’ll unlock. The problem is it’s just not the best way to play an arena shooter these days. Copying the early access Unreal Tournament on PC should’ve been their goal. But if you really just want to blow stuff up online, DOOM isn’t the worst multiplayer game that’s came out in recent years. It’s legs are just really short. While the multiplayer isn’t anything special, the rest of DOOM is. It’s one of the biggest surprises of the year so far and nothing to ignore. If you’re into deep stories and thought provoking campaigns, you’re out of luck. 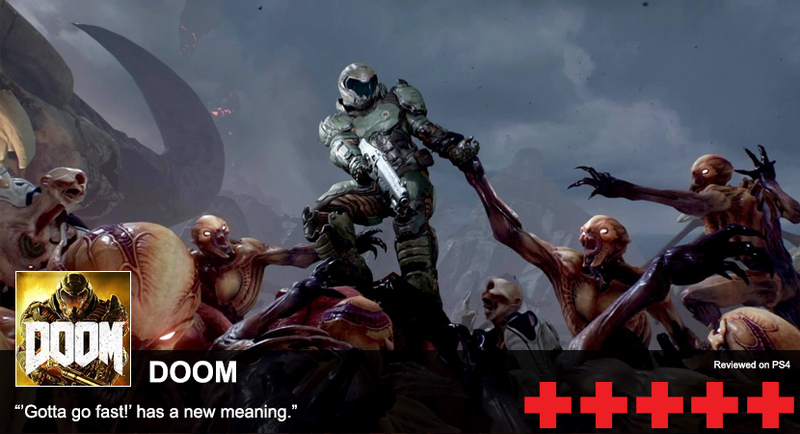 DOOM wants you to rely on what it original gave you in the 90s: swift thinking and fast reflexes. This is just another fine game of 2016 and something I recommend picking up immediately.